This may be a last minute post, but it’s a great recipe – I wouldn’t sell you short on that front! It was my mum’s birthday in April and I made her 3 batches of cupcakes to take into work, I’ve already shared the recipe for the Chocolate Coconut Cupcakes and I’ll be sharing some really yummy Chocolate Cupcakes with you soon – but today it’s the Raspberry Lemon Cupcakes! I usually make her lemon cupcakes on her birthday and they always go down really well, but this time I decided to mix things up and add a bit of raspberry into the mix. Lemon is still the primary flavour, but the raspberry addition really takes these cupcakes to another level of tastiness. The frosting is a creamy lemon buttercream with raspberry preserves folded into half of it. Simple, yes, but oh so good! You could go all raspberry or all lemon if you prefer, but I really love the combination of the two and swirled two-tone look is always so pretty. It’s an easy effect to get too, all you need is a piping bag fitted with your chosen tip (I used an large open star tip) then you spoon the lemon buttercream into one side of the piping bag and the raspberry into the other side so your frostings are side by side vertically through the bag like this– there’s no need to get this perfect, it’s definitely a messy job and no doubt you’ll end up with one reaching the tip first but it’s all good – just pipe into a bowl until you start seeing two tone. Then pipe the buttercream in swirls on top of your cupcake, and you have pretty two tone frosting! Some people achieve this effect by putting each frosting in a separate bag and then putting them both in another bag, and then there are special double bags/tips you can buy – and while that’d certainly be a little less messy it just seems like a waste of money and bags to me when you can get an equally good result with just one regular piping bag! Or maybe I’m just too cheap for my own good! With the added raspberry preserves the frosting can be a bit on the thinner side, which isn’t a bad thing at all and it still pipes pretty well as you can see. But you will want to store them in the fridge – and you definitely don’t want to leave them sitting in your conservatory after a photo shoot on a sunny day for an hour, as you may return to your frosting starting to fall off the cupcakes – that’s definitely not something I did, no ma’am (spoiler: I totally did, oops!). Since my mum had requested lemon cupcakes I made lemon the star of the show, but if you want to up the raspberry a bit you could fill the cupcakes with raspberry preserves instead of the lemon curd – how yummy does that sound? I might have to try that next! Or maybe you’re a lemon lover and want to skip the raspberry all together – hey, I wouldn’t judge, in fact I encourage it! Whatever way you decide to make these Raspberry Lemon Cupcakes, they’re gonna be delicious so go wild! Preheat the oven to 170C/350F. Line a 12 count muffin tin with paper cases. In the bowl of your mixer fitted with the paddle attachment (or using a handheld electric mixer) beat the butter and sugar together on medium high speed until pale and smooth, about 3 minutes. Add the eggs and vanilla and beat to combine. Whisk the flour, baking powder, bicarb and salt in a medium bowl to combine. Add the dry to the wet ingredients and beat on the lowest speed until just combined, scrape down the sides of the bowl as necessary. Add the buttermilk, lemon juice and zest, beat on low until just combined - scrape down sides of the bowl as necessary. Spoon the batter into the muffin cases, filling 3/4 of the way full. Bake for 18-20 minutes, they're done when the sponge is springy and a toothpick inserted comes out clean. Cool in tin for 5 mins then transfer to a wire rack to cool completely. Once cooled, fill the centre of the cupcakes with about 1/2-1 tsp of lemon curd - take a sharp paring knife and cut a small 1/2" circle from the middle of the cupcake that goes about 2/3 of the way through, fill with curd then trim the piece of cake you removed to make a lid and seal the cupcakes again. 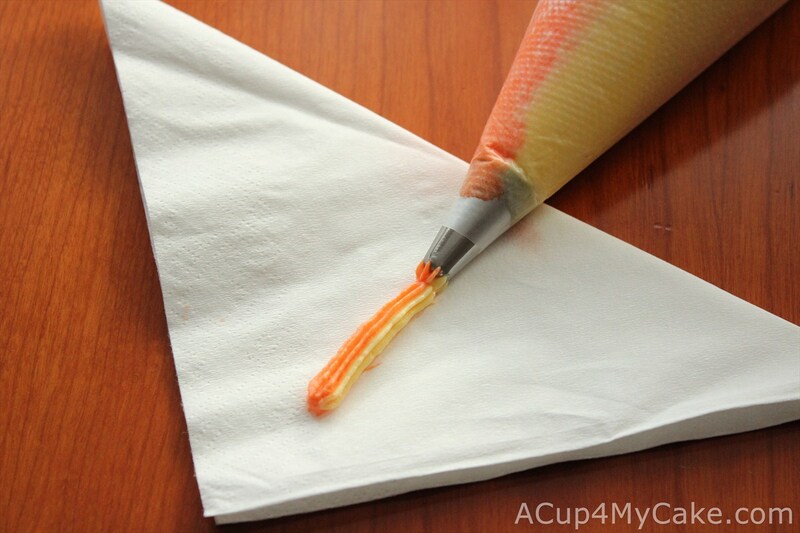 Fit a large piping bag with a large open star tip and place in a large glass, with the top of the bag folded over. In your stand mixer fitted with the paddle attachment, beat the butter on a medium high speed until it is smooth and creamy - about 5 minutes. Add the sugar and beat on low until combined (so you don't end up covered in a cloud of icing sugar!). Add the cream, vanilla, salt, lemon juice and zest and beat on medium high until fluffy - about 2 minutes. Remove half of the frosting and set aside. Add the raspberry preserves to the remaining frosting and beat for another minute until all combined. Spoon the lemon frosting into one side of the piping bag, doing your best to get it as far down the bag as possible. Spoon the raspberry lemon frosting into the other side. Gently squeeze from the top of the bag, piping into a bowl until the frosting starts coming out two tone. Pipe onto the cupcakes in swirls. You can achieve this same effect with any tip you choose. *Please note cup measurements are never as accurate as weighing. Cupcakes will keep in an airtight container in the fridge for 3-5 days, bring up to room temperature before serving. If you liked this recipe, you can subscribe below to get all future recipes directly to your inbox for free plus my FREE eCook Book! Those are gorgeous cupcakes Michelle. The combination of raspberry and lemon is classic an d delicious. Thank you Shari! Haha, if only you could send food through the internet! These Raspberry Lemon Cupcakes looks awesome! 😀 That’s definitely the response I want hehe, thank you! Thank you for staying up late to finish this post!! These cupcakes combine my favorite flavors, and look fabulous! If it makes you feel any better – I was up really late getting my post for today finished up as well 🙂 Sharing this! Thank you! That does make me feel better hehe, glad we were both able to get our posts out though! Thank you Jhuls! Happy FF! Can I just tell you how much I love these?!! I want one right now. Especially filled with that lemon curd…I love when there is a little surprise inside! Pinned and shared all over the place! aww thank you Michelle! Filling cupcakes is one of my favourite things to do, because I love the little surprise too! These are so unbelievably pretty and I’ll readily bet they taste amazing! Help yourself Judi 😉 Thanks! These are so pretty and sound delicious, I wish I could take a bit right now! Thanks so much Kaila, hope the rest of your weekend is great too! These are so pretty, and I love the flavors in there as well! I love lemon and the raspberry combination sounds delicious! So pretty too. I can’t believe how time flies by either. Never enough of it! Michelle -these look amazing and no, you are not being cheap using one bag – I would do the same! Is that a new profile pic – you look fabulous! Thanks Selma! I consider it being frugal haha! Thank you so much Loretta! I only changed my header photo yesterday hehe! They look so dainty Michelle. Love the combination of flavors. I love that lemon curd in the center just waiting to surprise you. I also like the idea of trying the jam. I may have to do half and half. Thanks for joining us at #SaucySaturdays. Half and half sounds like a great idea! YUMMY! I love the swirl effect. If I tried that it would look tie-dyed! I love the combination of lemon and raspberry! Haha, you can’t beat cupcakes decorated by kids, makes them so much more fun! You really can’t beat buttermilk, every time i bake something with dairy in and it’s not buttermilk I always regret it haha! It’s a lot easier than it looks, can be a bit messy getting it into the piping bag but as long as you get some each side you can’t really go wrong! Any way you could translate these into cups? Here you go. I can’t guarantee how well this will work as weight is much more accurate so the conversion can never be exact, but with a cupcake it should be okay. Do let me know how you get on! These sound amazing! I was wondering if you had the conversions to these from metric to US? When you say conversions to the US do you mean Oz or cups? If it is oz’s just pop it into google and they do all the hard work there e.g. type “200g in oz” in the search bar and it’ll give you the conversion. If you want it in cups, I do have conversions but please be aware that cups aren’t as accurate as weighed measurements so results may vary slightly. However I use the website traditonaloven.com to do my grams – cups conversions when I need them and I’ve always found it to be pretty reliable! I hope that helps. Give me a shout if you need any help! These look amazing! I’m going to make them for a birthday party I’m headed to tonight, do you have any suggestions on a good raspberry preserves brand or do you have a recipe for it? Thank you, Cathy! I don’t have a raspberry preserves recipe, but if you swapped out strawberries for raspberries in the jam recipe in this post: https://www.atipsygiraffe.com/homemade-jammie-dodgers/ that would work great. Otherwise just pick up a good quality brand from the store, I used Tesco finest raspberry conserve in these, but not sure where you’re based so you may not have Tesco there! I hope you love the cupcakes as much as we did, would love to see photos/hear about how they went! Thank you Karen! Unsalted butter is mostly a personal preference, I like to have control over how much salt I put in the recipe. Plus it’s easier to tell the freshness of unsalted butter, as it changes colour when it’s old (and smells bad when it’s rancid) whereas salt preserves it so you can’t tell how long it’s been in the fridge. Of course, that’s not really an issue if you’re buying the butter fresh specifically for the recipe. You can definitely use salted butter if you prefer, but I would omit the 1/2 tsp salt if you do. I hope your family loves the cupcakes! I made these for a birthday party and they were a huge hit! They tasted so good thanks for sharing this recipe!! I’m so glad you all liked them! And thank you for the lovely comment, always love to hear how my recipes turn out for others! I made your recipe twice and both times the cupcakes collapsed in the middle. I weighed all the ingredients the second time and doubled checked the oven temperature. The only thing I did differently was to use regular sugar. They taste good but have a funny bubbly texture. Can you tell me what I’ve done wrong? Hi Kathleen, I’m so sorry the cupcakes didn’t turn out perfect for you, that’s definitely not what we want! Without being in the kitchen with you I can only guess at what could have gone wrong, but the most likely would be either over-beating the batter – once you add the dry to the wet ingredients it’s really important to only beat at a low speed (or by hand) until the ingredients are combined and then stop! Otherwise you overwork the gluten and they won’t rise as well, plus the texture won’t be right – I’ve done this more times than I can count, very easily done! Another potential problem would be expired baking soda, it has a long shelf life but if it’s expired you won’t get a good rise in your cake at all! You can test it by dropping a little baking soda into some vinegar, if it bubbles up well it’s good to go! These cupcakes do have a high liquid content so they will shrink a little as they cool, but should only be a small amount. You could try adding a little less lemon juice (say about 1 tbsp less) and see if that helps. I recommend caster sugar in most of my baking purely because it is finer so it melts quicker and you get a slightly better texture, but using regular sugar really shouldn’t make that much of a difference. If you are worried it is, you can always run the sugar through a food processor to make it a bit finer! I hope this helps, if you have any more questions please just shout!! These sound amazing! Have you ever used the Russian piping tips? I’d like like to use them with this icing but am not sure it will be stable enough. Any thoughts or suggestions? Thank you Tonya! I haven’t used Russian tips yet, but I’m itching to! I don’t think this frosting will be stable enough for them unfortunately, it holds up to piping but only just. My suggestion would be to use all lemon frosting (will be fine for russian tips then) and maybe fill the cupcakes with raspberry jam instead of lemon curd to keep the raspberry flavour. You could also mix about 1 tbsp of raspberry jam to half the frosting instead, you won’t get much flavour but it will keep the two-tone colour a little (don’t use jam with seeds though, as they will clog up the russian tips!). Thank you Michelle. One more question, do you think substituting the raspberry jam with freeze dried raspberries would work? I have used freeze dried strawberries (ground into powder) in SMBC to put a slight strawberry flavor into pink champagne icing. I’m just not sure if it’s possible to achieve the same flavor intensity as that has been my only experience with freeze dried fruit in icing. I’ve never tried freeze-dried fruit in frosting but I think it would work if it’s ground into a powder. I love the taste of freeze-dried raspberries too, so I think that would be really great! I say go for it, maybe add a little at time to make sure it doesn’t affect the consistency too much and keep adding until you get a good flavour/stop if the consistency starts to go grainy. Would love to hear how it turns out if you do try it! Hello again! I finally made these cupcakes, however, due to incorrectly ordering freeze dried strawberries instead of raspberries mine were lemon strawberry cupcakes. The cupcakes were wonderful. Very nice cake. I found the lemon curd to be slightly too tart for my liking but my mother in law loved it. I may have left it on the heat too long. Not quite sure. The flavor was really intense, I was quite impressed with it. My husband wouldn’t stop eating the icing out of the bowl…it was delicious! Freeze dried fruit did make the icing pipeable using Russian tips and they were able to withstand room temperature without losing shape. I do not feel any flavor was compromised either as both the lemon and the strawberry came through well. Thank you for sharing a couple great recipes! So glad the freeze dried strawberries worked out well (and lemon and strawberry is a lovely combo! ), I’m definitely going to have to try that out! The lemon curd is very tart, which is the way I like it! If you want a less intense/tart flavour, I recommend starting out with 125ml (1/2 cup) lemon juice and skipping the reducing liquid part, it will still be yummy but less intense! This has been the best recipe that I have ever tried . It makes the most delicious and moist cupcakes and it even works out amazingly in the form of cake. Just love love love it. It’s just perfect . I’m so glad that you loved it as much as we did! Thank you! Delicious recipe! Love, love, love it! Thank you, Amy! So glad you liked it! Is there a way to use fresh or frozen raspberries instead of preserves to give them a more fresh taste? If you blend up the raspberries they should work well, but I would strain them so you don’t get a huge amount of seeds in it. I wouldn’t recommend frozen raspberries as will be too much water!